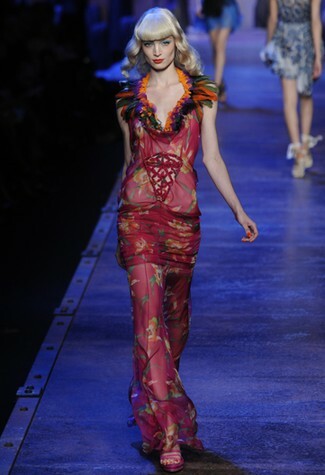 Dior Spring Collection 2011 reminisced some of my favorite movies, one, is the South Pacific. 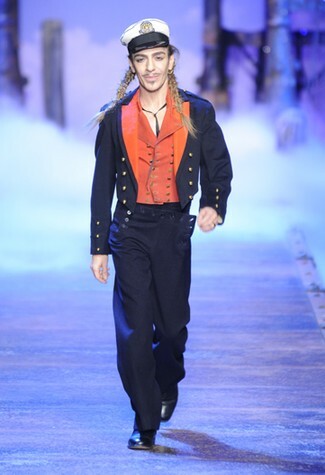 Considered by some to be one of the greatest Broadway Musicals where the film was adopted, Galliano started with naval uniform inspirations complete with model’s red lips and stiffed hairs of the 40’s. 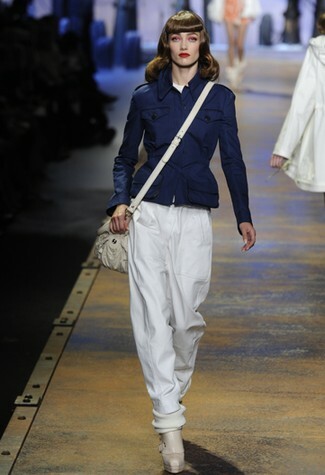 White sailor hats with navy collared over sized jackets, thick wool socks with stiletto ankle boots, a pleasant easy to wear appeal collection, anytime of the day and anywhere, to some enchanted evening…. in Bali Hai. Summer colors were purple and pink, bright orange, turquoise and neon green with garlands of flowers and lovely shells, feather necklaces, felt like Polynesian dancers in sarong twisted uppers. Heels too got multi-coloured ribbons in turquoise silk, or yellow edged in white, with origami glittered waistbands. 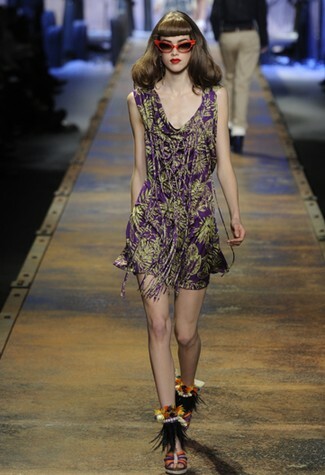 Galliano splashed palm leaves prints in yellow-green and fuchsia jersey dresses, with long gowns in light chiffons. His playful macrame’ gave a flirtatious mood in full skirts and some twisted fabrics like ropes added some arty embellishments to tropical evenings. Hawaiian print halter dresses, some crocheted peek-a-boo, turquoise bias ruffles with flowers, were tropical paradise indulgence on honeymoons or simply drifting away to the beach.